The National Water Information System provides access to water-resources data collected at approximately 1.5 million sites in all 50 States, the District of Columbia, Puerto Rico, the Virgin Islands, Guam, American Samoa and the Commonwealth of the Northern Mariana Islands. The USGS investigates the occurrence, quantity, quality, distribution, and movement of surface and underground waters and disseminates the data to the public, State and local governments, public and private utilities, and other Federal agencies involved with managing our water resources. 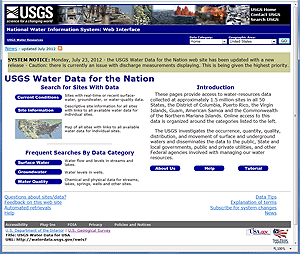 The National Water Information System is also available in part as a web service here.